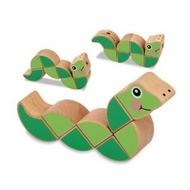 The Melissa and Doug Wiggling Worm Grasping Toy can be easily twisted and turned to form creative shapes! The bright shades of green, appealing expression, and easy-to-grasp size make this a perfect first manipulative! Each of the nine wooden segments are securely held together by a durable elastic bungee. The Wiggling Worm is brightly painted with non-toxic paint and suitable for children ages 6 months and up.